Nearly a year after the United States launched its first airstrikes against ISIS, the public remains broadly supportive of the military campaign. Yet Americans also have persistent doubts about how well the U.S. military effort is going, and there is no agreement about whether the U.S. should deploy ground troops as part of the military campaign in Iraq and Syria. 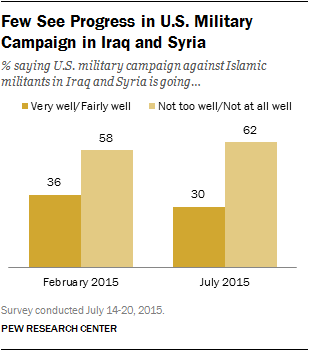 Consistent Support for U.S. Military Action. About six-in-ten Americans (63%) approve of the U.S. military campaign against Islamic militants in Iraq and Syria; just 26% disapprove of the campaign. Support is somewhat higher today than for President Obama’s first airstrikes against Islamic militants in Iraq in August 2014 (54% approved). In that poll, Republicans were 17 points more likely than Democrats to approve of U.S. military action (71% vs. 54%). Today, there are virtually no partisan differences in support for the U.S. military campaign against Islamic militants in Iraq and Syria; 67% of Republicans approve of the campaign, as do 64% of Democrats. Most Do Not Think Military Campaign Is Going Well. In the new poll, just 30% say the U.S. military campaign against Islamic militants in Iraq and Syria is going very well or fairly well. About twice as many (62%) say it is going not too well or not at all well. The share giving the military campaign a positive assessment has dipped six points (from 36%) since February. Nonetheless, a majority (55%) thinks the U.S. and its allies definitely or probably will succeed in its campaign against the Islamic militants, while 36% say it will definitely or probably fail. Will the U.S. Go Too Far – Or Not Far Enough? Nearly half of Americans (48%) say their bigger concern about U.S. military action in Iraq and Syria is that it will not go far enough in stopping Islamic militants; 43% express the opposite concern – that the U.S. will go too far in getting involved in the situation. This marks a change from the August 2014 poll. At that time, 51% were more concerned that the U.S. would become too deeply involved in Iraq and Syria, while just 32% were more concerned that the U.S. would not go far enough in stopping the militants. The share of Republicans who worry that the U.S. will “not go far enough” has risen 12 percentage points, from 57% to 69%, over the past year. Independents’ views have moved in the same direction: 48% say their greater concern is that the U.S. will not go far enough in stopping the militants, up 20 percentage points. 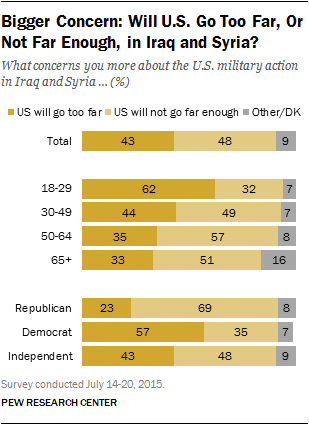 Meanwhile, most Democrats (57%) say the bigger worry is that the U.S. will go too far in getting involved in Iraq and Syria; 62% said this in August 2014. Young people continue to stand out for their concern over the United States becoming too deeply embroiled in Iraq and Syria. Fully 62% of those younger than 30 express this view, a much greater percentage than in older age groups. More Favor Use of U.S. Ground Forces. Last October, a majority of Americans (55%) opposed the use of U.S. ground forces to fight Islamic militants in Iraq and Syria; 39% favored the use of ground forces there. But by February of this year, opinion had become more evenly divided (47% oppose, 49% favor). The current survey finds little change since February: 49% would oppose the deployment of ground forces against Islamic militants, while 44% would favor this. The partisan divide over the use of U.S. ground forces is stark: 63% of Republicans favor the use of U.S. ground forces in Iraq and Syria; an identical percentage of Democrats are opposed. Independents are divided (48% oppose, 44% favor). Majorities across nearly all demographic groups support the U.S. military campaign against Islamic militants in Iraq and Syria. But there are notable differences in support. About half of adults (52%) under 30 approve of U.S. military action against ISIS, compared with 60% or more across older age groups. Women are 12 points less likely than men to approve of the U.S. military campaign (57% vs. 69%). And while two-thirds of whites (66%) approve of U.S. military action in Iraq and Syria, smaller majorities of blacks (57%) and Hispanics (55%) agree. Nearly three-quarters of adults with post-graduate degrees (74%) approve of the U.S. military campaign against ISIS, as do 69% of college graduates. Among those with less education, 60% support U.S. military action. Among the public overall, more oppose (49%) than favor (44%) the use of U.S. ground forces in Iraq and Syria. Some demographic groups that are less supportive of U.S. military action generally, such as women and blacks, oppose sending U.S. ground troops to the region. More than half (54%) of women say they would oppose sending U.S. ground forces to fight Islamic militants in Iraq and Syria, while just 37% would support this action. Men, on balance, favor the use of U.S. ground forces (51% favor, 44% oppose). Whites are divided over deploying U.S. ground forces to Iraq and Syria (48% favor, 45% oppose), while most blacks (64%) would oppose the use of U.S. ground forces against Islamic militants there. While better-educated adults overwhelmingly support U.S. action against Islamic militants in Iraq and Syria, they oppose the use of U.S. ground forces in this conflict. Among those with post-graduate degrees, 55% oppose sending U.S. ground forces to fight ISIS, while just 39% favor this. College graduates also oppose the use of U.S. ground forces (52% to 41%). In contrast, those with less education are divided, with nearly as many supporting (45%) as opposing (47%) the deployment of U.S. ground forces. 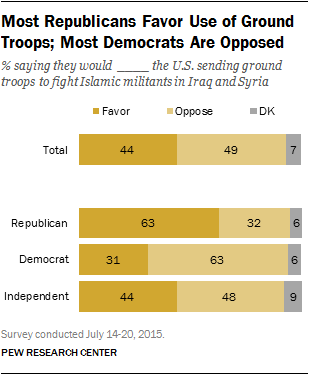 15 Years After 9/11, a Sharp Partisan Divide on Ability of Terrorists to Strike U.S.